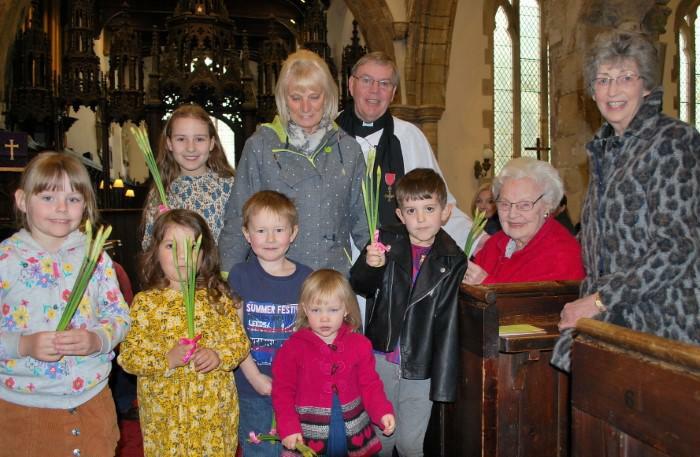 Three great-grandmothers were among the congregation treated to posies of daffodils during the Mothers’ Day service at St Edmund’s Church, Sedgefield. Mrs Doreen Richards, Mrs Yvonne Houston and Mrs Anne Eyley were presented with the flowers by youngsters who volunteered to help the Team Rector, the Revd. Geoff Short, during the service. Everyone else in church that morning also received daffodils donated by Sainsbury’s in the town. Lessons were read by mother and daughter Susan and Laura Wallace. Panny Pighills led the Intercessions and Alex Ord was organist. Pictured with the young helpers are Mrs Houston (centre), the Rector, Mrs Richards (seated) and Mrs Eyley (right).